Everyone loves crocodiles - don't they?? Darwin crocodile tours and parks allow you to get up close and personal with Australia's top predator, crocodylus porosus, the Estuarine Crocodile. Crocodiles are ambush predators. 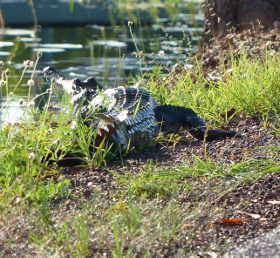 Crocs can be hard to see in the wild. More commonly known as saltwater crocodiles or salties, these ancient animals are now common throughout Northern Australia after nearly being wiped out by extensive hunting for their valuable skins. Australia's other native crocodile, the freshwater Johnstone Crocodile is smaller, not as common and mainly found further inland in freshwater rivers and billabongs. See more pictures of adult crocodiles. This is a leading wildlife research facility, specialising in crocodilian research. Crocodile feeding three times a day and a range of other animals including big cats, monkeys, giant lizards and spectacular birds. About 70k's from Darwin, the Adelaide River Jumping Crocodile cruises are a fantastic way of actually seeing crocs in the wild. 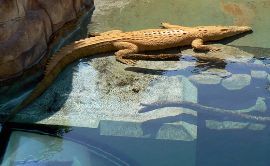 See a crocodile from an underwater perspective at this glass window on a crocodiles personal life. The Park also has an extensive collection of kangaroos, bats and other animals. More on Territory Wildlife Park here.. Located on the Stuart Highway about 40 k's from Darwin, this is a commercial crocodile farm which used to have visitor facilities, however it is now closed to the public. One of our most famous crocodiles is preserved here. Sweetheart was a 5.4 metre male croc famous for attacking outboard motors on local fishing boats who strayed into it's territory in Sweet's Lookout Billabong. Eventually trapped by Park Rangers but finished up in the museum because it did not survive the trapping. Now open, this tourist complex at 58 Mitchell St. Darwin makes live crocodiles accessible in a specially built tourist venue. A special protective cage lets you get into the tank with a real saltwater crocodile. Check the crocodile park timetable. 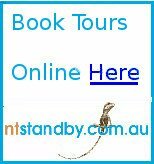 Goannas, pythons, lizards and a 222,000 litre aquarium full of barramundi, turtles and freshwater fish make this the best reptile park of it's kind in Australia. There is always a chance of seeing crocodiles in the wild as you move around the NT and other parts of Northern Australia. Fogg Dam is one place where crocodiles are often seen and is worth a visit for the birds and scenery as well. See more pictures of adult crocodiles and information on Australian Crocodiles. The commercial farming of crocodiles has grown substantially in the NT since the first crocodile farms were established in the 1970's.